What in the world is a mason bee? I hear this all the time. It is a wonderfully gentle, native North American bee. When you think of bee pollination, what comes to mind? I bet it's not the mason bee (Osmia lignaria), but rather the honeybee. Am I right? For most people this is true. Since honeybees were introduced from Europe by early North American settlers they have gotten the lion's share of attention. Indeed, honeybees are very important in both honey production and pollination. One hive of honeybees can consist of many thousands of bees. Sadly, however, almost no one knows there are actually numerous native North American bees that are very skilled at pollination. Native bees did 100% of the bee pollination before honey bees arrived. You may be even more surprised to know they are the more efficient pollinator for native plants. Cornell University Entomology Professor, Bryan Danforth, says the native bees are three times better pollinators than honeybees. According to Danforth, "Honeybees are more interested in the nectar than pollen. They don't really want the pollen if they can avoid it. Wild, native bees are mostly pollen collectors... collecting pollen to take back to their nests." (Krisy Gashler - Cornell University - ChronicleOnline, Oct 24, 2011) Mr. Danforth is one of several researchers involved in a five year study of how Colony Collapse Disorder affects native bee species. While the honeybee will always play a major role in commercial pollination, solitary bees are perfect for backyard gardens and fruit trees. Raising solitary bees is growing in popularity. They are gentle and can be raised by anyone, even children, without fear of being stung. Research is also ongoing on using solitary bees in large commercial operations most effectively. Mason bees have many species. Masons are also called blue orchard bees or blue masons and are among a group of bees known as "solitary bees". Various species of Osmia exist all around the world, and many have been imported to the U.S. with great success. The hornfaced bee (Osmia cornifrons) is a great example of an imported bee. Imported from Japan, they are a fantastic success. These bees have the description "solitary" because they do not live in hives or have the complex social characteristics of honey bees. On the job, honeybees and mason bees, hornfaced bees, bumble bees, and others get along great and can work side by side without conflict. With the continuing decline of the honeybees, more attention is being given to sollitary bees for pollination. This page will explain how solitary bees differ from honeybees in how they operate. A blossom has both male and female parts. 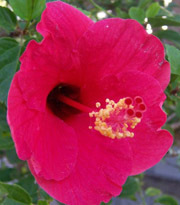 The male parts contain the pollen which is found on top of the stamen. The stamen are almost hair like stalks that feature pollen balls at their tips, known as anthers. The bee collects the pollen as it travels from plant to plant. 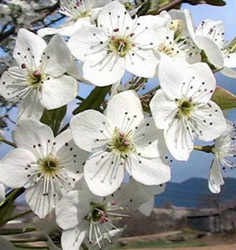 The "Styles" are the female parts located at the center of the blossom. Styles are basically slender tubes. At the top of the style is a "stigma". The stigma has a sticky surface which receives the pollen to start the process of pollination. Pollination occurs when pollen gathered from the anther of another blossom comes in contact with the stigma and proceeds down the tube to the ovaries. Have you seen the 1970's show "The Odd Couple"? Two divorced men share an apartment, one is neat and organized, the other is sloppy and careless. The two opposites make a funny combination. That may be a good picture of the honeybee and mason bee. Honeybees visit a lot of blossoms. They truly enjoy the nectar, but will also collect pollen. When honeybees approach a blossom they are more precise than other bees. Honeybees work carefully to fill the pollen baskets on their hind legs. You have probably seen these pockets bulging with pollen. 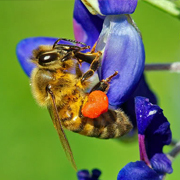 The pollen is moistened with nectar to form a sticky covering so not to lose any. Honeybees, are so precise that less pollen comes into direct contact with the blossom's styles resulting in less efficient pollination. 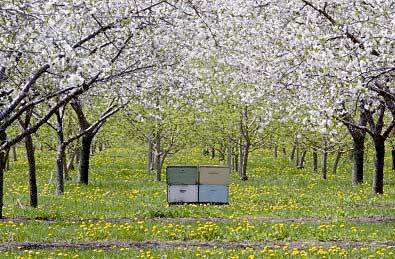 To add to the difficulty, honeybees move more methodically from blossom to blossom on a single tree. This is not good for pollination since cross pollination is most often desired. Some researches suggest that only 5 percent of the blossoms visited by a single honeybee result in successful transfer of pollen. Hence the need for an entire hive of honeybees for each two acres of trees. The mason is a different character altogether. They are not as concerned about the loss of pollen. They tend to be more erractic about their flight patterns and will fly back and forth between trees. Instead of pollen baskets, masons are equiped with a hairy abdomen that is loaded with specialized hairs, called the "scopa". They crawl all over the blossom with their pollen-packed abdomens touching every part of the blossom, including the styles. They drop a lot more pollen along the way than honey bees. As you know, honeybees live in hives and are well-known for their complex social life. Each bee performs a specific function inside the hive. Just like any big city, there is a multitude of jobs that must be filled. There are guard bees, hive maintenance, trash collectors, bee nursery operators, etc. Forager bees must get the nectar and pollen back to the hive to be used by other bees. These are the pollinators. A major advantage of honeybees (other than honey production) is that hives can be transported from one farm to another for pollination. It is actually a very big business renting out bee hives. Honey bees, having been introduced, excel at pollinating non-native flowering plant species. Native bees excel at pollinating native species. Honeybees will fly miles away from the hive to find the pollen they like. For whatever reason, they will sometimes bypass many perfectly good trees and fly to another orchard to collect pollen. Managing a hive takes considerable knowledge and specialized equipment. Finally, honeybees are in trouble. They are in rapid decline largely due to Colony Collapse Disorder. An estimated 90% of feral hives have been killed. They are also being attacked by the zimbie fly, a tiny parasitic fly that is slowly advancing into new areas of the country. 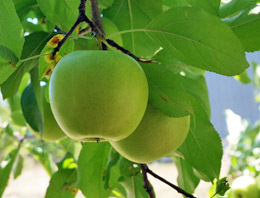 Many orchards are now introducing the mason and hornfaced bees for pollination. Mason bees do not produce honey. They also do not like to travel more than a few hundred feet from their nests. This makes them perfect for backyard bee enthusiasts. In the wild they build a nest inside tunnels left behind by tree boring insects. Mason bees cannot dig the tunnels themselves, but most look for an abandoned one. This is perfect, since we can supply them with all the tunnels they need. These homes are most often wood planks or wood timbers with drilled holes. When they have laid all the eggs within them (approx. 34), with each egg placed on a pile of pollen separated by a thin mud wall, the female dies. It takes about 8 weeks or so. The young egg is left alone to hatch and pupate, emerging the following spring. Most of their brief life is spent flying from blossom to blossom collecting pollen. The end result is greater pollination. Solitary bees will stay close by, never venturing more than a few hundred feet away from the nesting tubes. This is great news for home gardeners. Every single home can have their own private pollinators. Yay! It is important we all learn about our native bees. Raising mason bees is easy to do and requires just a few items. Best of all there are no expensive bee suits, no hives to deal with, no aggressive bees, and no worries about being stung. With honey bees falling victim to Colony Collaspe Disorder, solitary bees are gaining popularity. It is time to start thinking about raising your own mason bees. Researchers are still looking for better ways to supply solitary bees in large quantities for large commercial orchards and farms across the U.S. While you can transport honey bees across great distances, native bees are most active in the geographical area they were born in. They are gaining ground and have already many success stories. 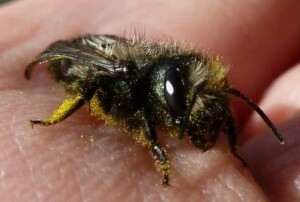 Discover why mason bees are so gentle that you can hold one in your hand. Stings are extremely rare. Find out why every home should have a mason bee house.